Buying my dress was a little different than most brides! I live in Washington and didn’t have enough money to buy a plane ticket to come home to WI just to look for a dress with my mom, sister, and bridesmaids. Instead, I found a bridal consignment store in Seattle called Blue Sky Bridal. I saw a dress on their website that I was interested in so I booked an appointment. The girl that helped me was so nice! She helped me pick out a few dresses to try on, including the one I had seen online. I didn’t really love any of the other ones we picked out but I put on the last dress (the one online) and loved it! I really loved the back of the dress. I stood in it for probably 45 minutes while I called my mom, sister, and dad (I think) and sent pictures to my bridesmaids. I walked out of the store with the dress and the veil! It's so hard to pick specific moments and say they were my favorite because honestly the day as a whole was amazing. We did not see each other before the ceremony. If we had to do it again, I think we would do it the same way! Our ceremony was at 1:30 so we were still able to spend the majority of the day together. Plus, I think we both enjoyed spending time with our bridesmaids and groomsmen separately. A mutual friend introduced us. The first time we met, all three of us went bowling and then to Applebee’s for half-prices apps. Jake’s opening line when he got in the car was “Hi, my name is Jake. I didn’t learn how to tie my shoes until the 5th grade.” That pick up line currently has a 100% success rate 🙂 Jake and I met on December 29, 2013 and officially started dating on March 22, 2014. It’s hard to believe that it’s been just over four and a half years already! In September 2016 we moved to Washington. We only spent about 10 days together before Jake had to leave on a two and a half month deployment. On December 23rd, Jake’s ship (the USS Sampson) returned home and I was waiting on the pier with other family and friends to welcome them home just in time for Christmas. I noticed that Jake was the only one in his uniform and I had a feeling something was going to happen. Jake was the first person off the ship and I met him with a big hug. Then he got down on one knee and asked me to marry him! It was pretty neat because the entire crew on the ship was watching and cheered! And it turns out that Jake bought the ring in Auckland, New Zealand while he was on deployment. Overall, our wedding experience was everything we dreamed it would be. The day was great and everything went smooth. We had so much fun with our family and friends and we are just so grateful to have such a wonderful and loving support system! Don’t stress about the little things! I spent time on a bunch of details that I didn’t even have time to take a look at. Don’t get me wrong, I was trying to take it all in and look at all the hard work that went in to planning the day, but there were some things that I would not spend so much time on if I did it again! Also, just have fun! Remember that the day is about you and you choose how much fun you have! And on the same subject, don’t worry about whether or not your guests are having a good time. You can’t spend every minute of the reception with every single person, but your guests are just happy to be there with you! In general, your wedding is as fun as you make it (for yourself and your guests too!). Finally, if you set your expectations low, you won’t be as disappointed if something doesn’t go as planned. And on the other hand, you will be pleasantly surprised/happy when everything goes better than you had hoped! 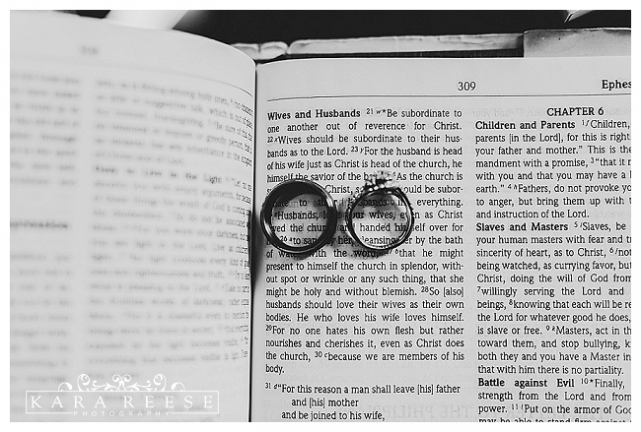 If you can, schedule engagement pictures or a mini session prior to your big day! It helps a lot, especially if you’ve never been photographed before! You get a sense of how a photographer works and practice does make perfect! 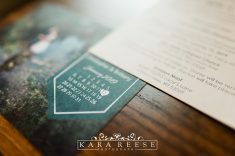 Kara Reese Photography was amazing to work with! She arrived on time and was taking pictures right away! After the ceremony, Kara was so quick with the camera and our family photos went much faster than I thought. Kara also did a great job sticking with the list of pictures that we wanted. One thing that really stuck out to me was that Kara was actually using the pictures I had added to a Pinterest board that I shared with her! This is a great tool for inspiration so I would definitely take the time to make a Pinterest board for Kara! 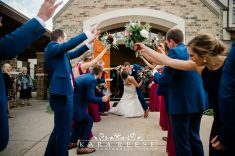 Overall, our experience with Kara was awesome and I would highly recommend her to anyone that is looking for a photographer! Kara was creative and organized. She was easy to work with and was flexible! Kara was also in a good mood and brought a positive energy with her that made working with her just that much better! How did your wedding party do with photos? The only thing we (the girls) talked about was how to hold our flowers (and I can’t remember exactly but I’m pretty certain that Kara helped with this!). Our wedding party was really easy to work with and they are all very close friends or siblings. We all just had a great time and group pictures went smooth (and turned out great!!!). 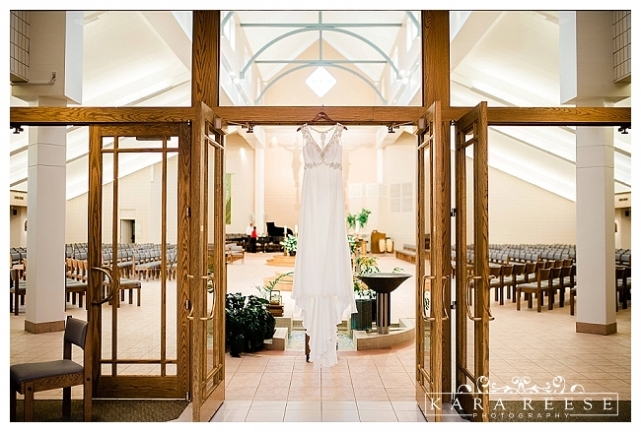 What were you nervous about prior to your wedding? I don’t think I was nervous about anything on our wedding day! You get to a point where there is nothing more that you can do to prepare for the day. If I had to pick something, I think I was actually most nervous about pictures and that’s because I knew that I would look back on them for the rest of my life. But they turned out so beautiful!